Beginners are often taught to “always press behind the darker fabric” – to avoid the possibility of a “shadow” showing through the paler fabric. This is still a good, basic rule to follow if no other considerations override it. However, for the best results, read on to find out where you should ignore it – the basics are on this page (but you may not be familiar with all of them); for the next stage, click to go to the Pressing for Perfect points: diagonal seams page. e.g. When stitching simple strips together – in the Amish Bars design for instance, seams can all be pressed behind the darker fabric. Can this horizontal seam be pressed behind the dark? However, this rigid rule is not always possible to follow – for instance on a simple four square unit, although the vertical seams could both be pressed behind the darker fabric, the longer horizontal seam will always be half behind the darker, and half behind the lighter fabric, whichever way it is pressed. The problem of a shadow showing through is less likely with the excellent quality fabrics available now. Having the courage to break the rule under certain circumstances allows easier matching of seams, and reliably perfect points – every patchworker’s dream! Can you see any shadows? Now look at the back! All of the quilts and wallhangings that I have designed have plenty of seams pressed behind the lighter fabrics – but it isn’t noticeable. What people DO notice is the sharp points! visibility of previously made points when stitching across them. Sometimes, of course, the requirements clash, and then you have to make your own mind up as to which is most important! Or, if you buy any download pattern from my Shop, you can do so in the confidence that all the pre-planning has been done for you – all you need to do is follow the instructions, and it will work out perfectly. 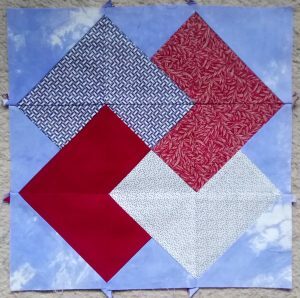 When the centre panel of a quilt is joined to a plain border, there will always be more bulk in the pieced section due to the seams already present. Always press the seam towards the border, which will only give one extra layer of fabric, and avoid folding back the bulky seam joins of the pieced section, which would double the larger number of layers of fabric, and could give points a blunt appearance. 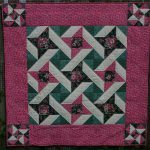 This situation also arises when joining any pieced section to a plain one – a pieced border onto a plain one, adding setting triangles, or sashing strips to a pieced section. Always press seams away from the pieced section. 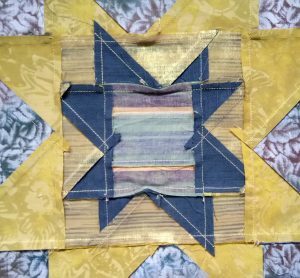 When joining triangles onto a border or into a block, the pressing direction of the seams which created the triangle can also help avoid chopping off the triangle point when stitching the next horizontal seam. It is important to press so that the intersection of the two seams already stitched (i.e. the triangle point) can be seen, and then it is possible to aim for this point when stitching the horizontal seam. If the vertical seam on the unit below is pressed behind the Dark fabric, the triangle point is hidden and likely to be cut off when stitched. 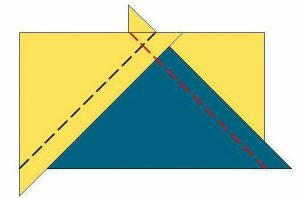 Although the vertical seam in the diagram below is now pressed behind the Light fabric, the point where it intersects the triangle seam previously stitched can now be seen, and the horizontal seam positioned carefully to pass just above it, making a perfect triangle point. Stitch with the triangle side uppermost (so that you can see the junction), just to the seam line side of this point (so that the tip doesn’t hide unseen in the ditch of the seam), even if this means that the seam is no longer ¼” wide – it will look right on the front, which is what counts! Use this principle whenever joining already formed triangles onto something else. The need to expose the triangle point over-rides the preference for pressing behind the Dark fabric. The other advantage of pressing this way is that of reducing bulk – folding the half square triangle unit back on itself creates a maximum of nine layers of fabric, rather than the seven created by allowing it to stay open as in the second diagram. Unfortunately, it is not always possible to use this rule, particularly if you have a row of half square triangles – for example on a border. Whichever way the seams are pressed, the triangle points on one edge of the strip can clearly be seen, enabling the seam with the background to be positioned exactly through the points. As it is impossible to press the same seam in both directions at once, however, the points on the other edge of the strip are inevitably hidden, making it more difficult to position correctly the seam with the background. Another common situation where it is helpful to remember to use this “expose the points” rule is when making Flying Geese units. It doesn’t matter which way the first seam is pressed, but the triangle point will be hidden if the second seam is pressed in. If the first seam is pressed out, and the second seam is pressed in, then the triangle point cannot be seen. Always press the second seam out, so that the point can be seen when the Flying Geese units are assembled into the border or block. 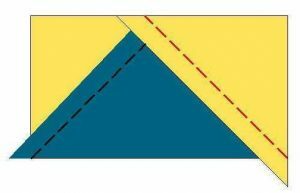 If the first seam is pressed either in or out, and the second seam is pressed out, then the triangle point is exposed, making it easier to line up the next seam successfully. The “avoid pressing bulky seams back on themselves” rule also needs to be remembered when joining several Flying Geese units together – for example in a border. Don’t fold back the FG points. Press the seams that join the individual units away from the points. Press seams away from Flying Geese points when joining. There are other points to consider when deciding which way to press seams. Where any seams meet, the join will be flatter if the bulk is spread out. Most of us use this underlying principle when joining squares together – we make sure that the seam allowances are pressed in opposing directions. If the seams are both pressed to the same side, this gives a very bulky join, and as the machine travels from two thicknesses up to six, the fabric layers are likely to shift, causing the line-up to move. Try this on a simple four patch sample. Cut two Dark and two Light squares, and stitch them together in pairs. With the seam allowances pressed in opposite directions, place them right sides together, holding the seams between your thumb and fingers. Seams pressed in the same direction produce a bulky join, and a poor line up. Seams pressed in opposite directions produce a less bulky join, and a better line up. “Shuffle” the seam until it nestles together perfectly. If you are not sure whether it feels right, start with the seams visibly too far apart. It’s now easy to feel the gap before gently pushing together until it closes up. Pin across the seam to hold in place while stitching. This should give a perfect line up. If you find that it still shifts, you may need to reduce the foot pressure on your machine, or hold the seam flat with your fingers at the side, while it feeds through. Always use this principle whenever matching vertical seams, even if it means pressing some seams behind the lighter fabric. 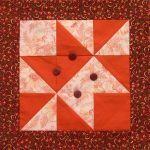 Plan the pressing for the block before you start stitching. Planning the pressing for a simple nine-patch will depend on the colour placing. 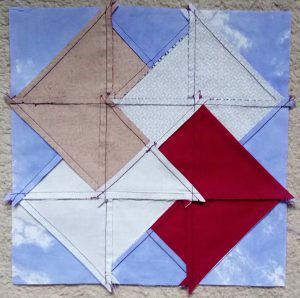 For example, when making up a Nine Patch block, the squares are usually joined into three rows, and the rows then joined together into the completed block. Pressing all of the first set of seams behind the darker fabric would make them all go towards the centre, producing bulky joins when the rows were assembled. Pressing the seams alternately in and out gives a better result. Note that it is still best to choose the option which avoids the Light fabric where possible – if I change the colours in the block, as in the last example, I reverse the pressing as well. Can you see how the vertical seams are pressed “in, out, in” so that they match perfectly on the front? When joining squares or simple blocks together, always alternate the direction that the vertical seams are pressed, to give a good line up of all the seams. This is particularly easy if the darker units alternate with the light ones, meaning that the vertical seams can all be pressed behind the darker fabric. Pressing is simple to plan in this way for single blocks, but if blocks are to be joined together flush (i.e. with no sashing) the same alternating principle needs to be applied at every place that the seams meet. 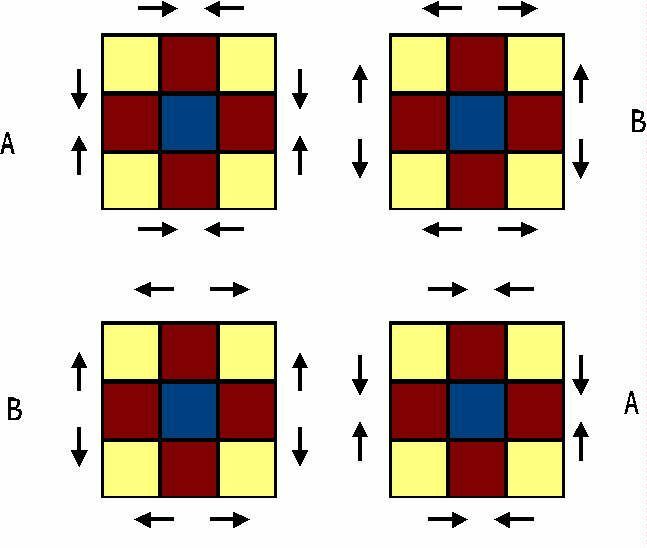 If all the blocks are made and pressed exactly the same, the seams are very unlikely to line up easily where the blocks join. As the vertical seams at the edge of one block now need to line up with the vertical seams at the edge of the adjoining block, the units on the edge of the next block need to have their seams pressed in the opposite direction. This in turn means that all the other seams in the block have to change! The longer seams joining the rows need to be considered too. On a single block, it often doesn’t matter which way these are pressed, but for the horizontal seams to join successfully to other blocks, these need to be pressed alternately as well. Thus it is necessary to modify the pressing, and make the blocks in two varieties; call them A and B. Press the block seams in two alternating sets, A and B to enable the blocks to join together smoothly. B has the vertical seams pressed out, in, out and the horizontal seams pressed out from the centre (despite the fact that this makes some behind the Light fabric). 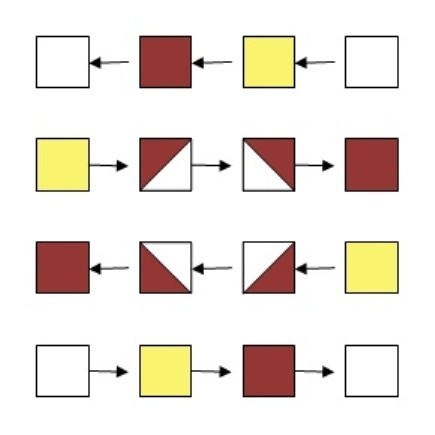 Use this principle to plan the pressing of all the vertical and horizontal seams whenever joining blocks, even if they are more complicated than the simple nine patch shown here. 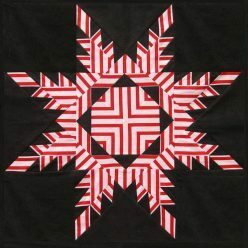 If you want to try this out on one of my patterns, look at the page for the Friendship Star quillow. Note that although you need to worry about pressing blocks differently if they have an odd number of units (9 patch, 5 patch etc. ); even numbered (e.g. four patch) blocks will usually meet up correctly on the vertical seams even if all the blocks are pressed the same; and the simpler horizontal seams are the only ones that you need to think about alternating.Look at the pressing diagram for the four patch “Oh Susanna” shown here – the neighbouring block will fit without altering the pressing of the vertical seams. I usually pin labels onto the top left hand corner of the finished blocks identifying them as X or Y, and then I can use them alternately when doing the final layout. Plan ahead like this for any block before you start stitching, and put a pressing diagram by the ironing board to help you remember what you decided………. If you have read this far, then well done! It may seem that there are a lot of things to remember – but the results are worth it, as you will avoid hours of frustration and unpicking. Now look at how to press diagonal seams – that is the part that many people don’t know about, and it makes such a difference! Or try the free Double Cat download pattern – this is just a little block to experiment on, as it has plenty of tips to help you get it right. If you don’t feel confident enough to plan the pressing of a project yourself yet, then have a look at the projects in my Shop as all of the patterns I sell have the pressing pre-planned for you. The projects which would be particularly helpful to practice these techniques are Friendship Star, Provencal Sampler and Catherine Wheel . If there is a project you like in My Designs for which the download pattern is not yet available, then Contact Me.